Did you know that organic search results from Google generate 7 out of 10 clicks on average? It’s real and surprising when you consider Google continues to add more paid search listings to their results. The question becomes how to get your website to the top of Google for free and keep it there for a long time? The other question is how to show up in Google search consistently for new content. 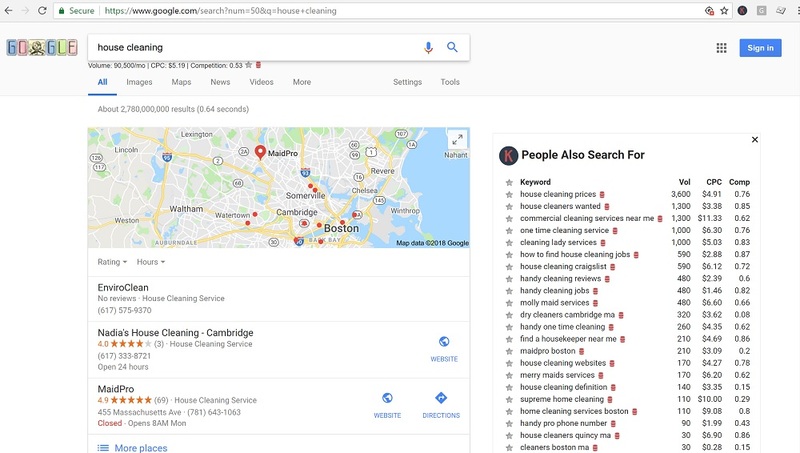 Let’s dive into the steps together and pretend that we are a house cleaning service looking to show up in search results. If you would like help at any point, I offer Boston SEO Services where I perform this type of analysis for my clients. I recorded a video below that is a nice addition to the steps below. How to rank on page one in Google for free is the goal in search engine optimization. You want to get your website to be on top of Google search since that is where the lion’s share of clicks happen. Below is a picture for a term I bid on with ads and show up on through with organic search. 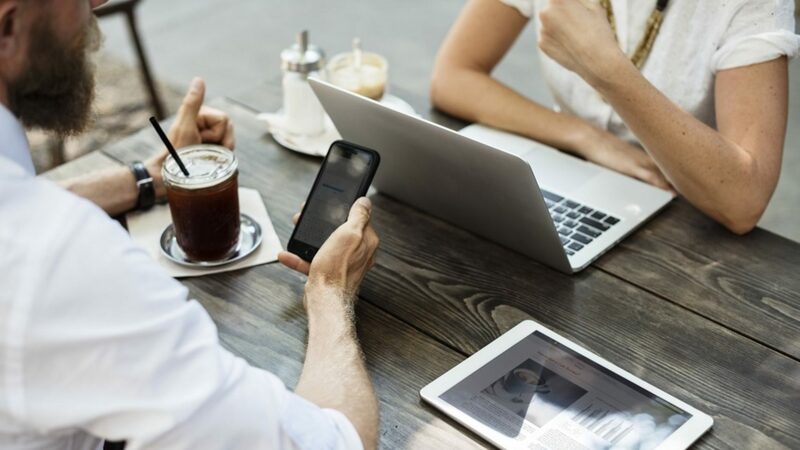 According to the study I linked to earlier, you can expect organic listings to receive the bulk of click activity even with paid ads at the top. What’s important to understand is that the further down page one you are on Google, you will recieve fewer clicks. The first five organic listings make up over 67% of the 70% clicks that organic receives, so getting to the top is critical. Here is the breakdown below from the same source of the click through rate for each organic position in Google. Now that we know how Google displays its results and why organic is valuable, we need to perform keyword research. Keyword research is more than choosing a word like “house cleaning” and saying I want to rank for that term. Instead, you should take the primary phrase like house cleaning and build your strategy around long-tail variations of it. The keyword research portion will let you know the search volume and competition of the word, so you will have an idea what is more valuable to go after. Some of my favorite tools to gather search volume include Ahrefs, SEMrush, Moz, and Keywords Everywhere. In this picture below, I’m using Keywords Everywhere to get instant search volume of keywords directly in a Google search. Let’s say that the keyword research we performed came up with these following term below. The primary term is still house cleaning, but now we have new variations that stem off that one term. The more long tail terms you go after with your strategy, the more traffic potential you have. As a note, you won’t find one keyword research tool that 100% accurately portrays the correct search volume. The best way to optimize your page with these terms is to have your title tag include the primary phrase along with a second term. The title tag is a direct ranking factor for search engines, so take advantage of it with a proper strategy. 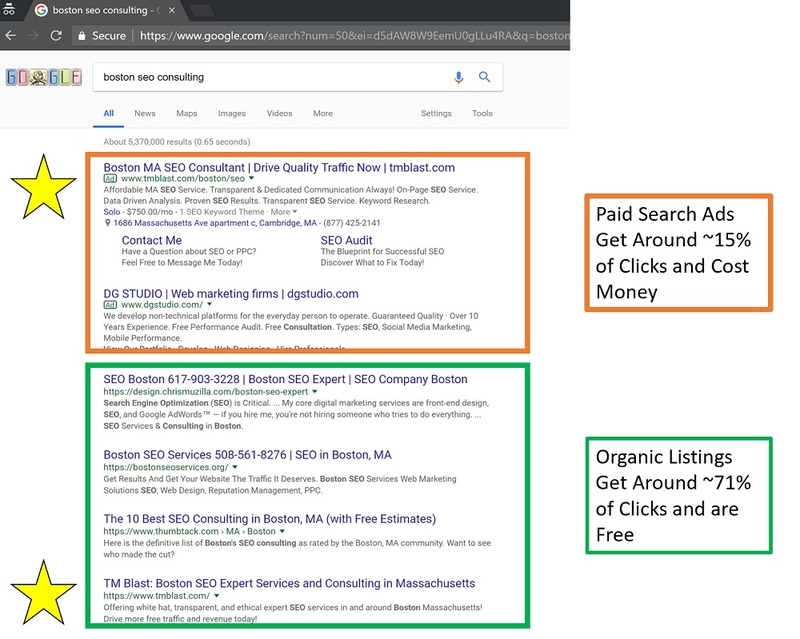 Here is an example of a before and after title tag and how the latter looks more compelling and gives Google more information to work with and rank. You also want to have your title tag interesting enough to generate a click, so make sure you are writing something that is compelling! Sticking with direct ranking factors, you want to optimize your H1 tag on your page. Think of the H1 tag as a heading within a chapter of a book. The heading is in bold or more significant than the traditional text, so you can sense it’s more important to notice and read. This same type of thinking works with search engines when they see an H1 tag. To get the most out of the H1 tag, you should use an extended variation of the primary term. As a note, you should only have one H1 tag per page, but you can also use H2 to H6 tags as often as you like. Each step down from an H1 tag holds less ranking potential so that you can optimize two of these tags like this. H2 Tag Suggestion –> What’s Included in a Deep House Clean? When creating an H1 tag, you should use a semantic version of the primary term to optimize the page even better. Affordable is in the title tag and inexpensive is adjective that is similar to that, so go after that as well. The H2 Tag is not as important as the H1 tag, but I would optimize my content for this type of query too. Question and answer content can show up in Google’s answer box, so this is a great opportunity to get your page featured in that result. Word count plays as a ranking signal for Google and Bing, but not for the reasons you may think. 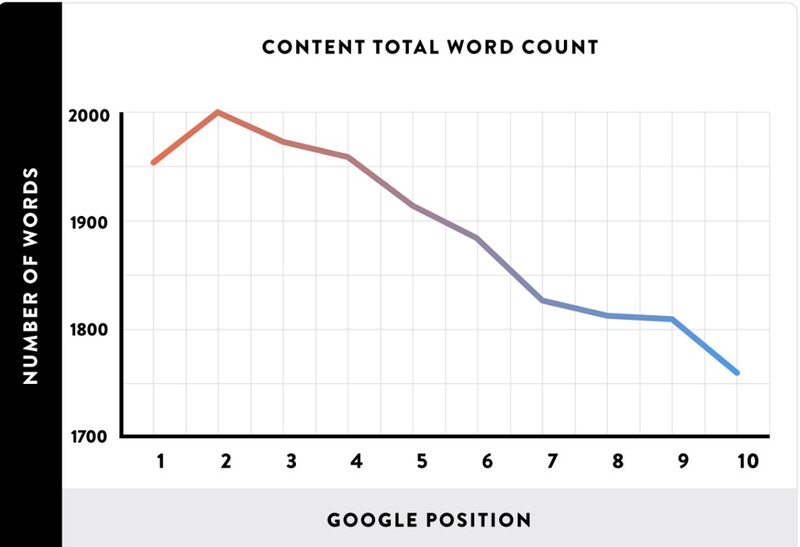 Backlinko wrote an in-depth guide showing how long-form content outranks low content the majority of the time. That’s true in the sense of quantity, but the majority of the time it’s because of the quality of the page covering that topic to a precise degree. Remember above how I mentioned we should use a question in the H2 tag? Merely writing what the answer would automatically make your content even longer than before. Performing keyword research from the start has given us many ideas. The content on our page will need to include those type of words along with conversation queries to rank in voice search. Here is a visual from Answer the Public that gives you an idea of how people search and look for answers around this topic. Take advantage of this by asking and answering the question directly as we did with the H2 tag. Below is an example of how I rank in Bing for an answer box using this strategy with the H2 tags. Displaying before and after picture is a spectacular way of showing your house cleaning service to potential customers. For a person searching in Google and coming to your site, they can see the quality of work that you provide. To get the SEO benefit, you should wrap the image with an ALT tag. The ALT tag is code that tells Google and Bing what this picture is showcasing. By giving search engines more information on the picture, they can better display it in their image search results. You also want to give your ALT tag a clear message for two reasons. First, Google and Bing will appreciate more content to work with and rank. Second, someone using a visual reader will have the ALT tag read it out loud to them, so making it descriptive will help them out. Competitor research can uncover new opportunities for you to go after. For example, you may notice that none of your competitors use video on their page to sell their service. Adding a video to your page can give your users a better experience and even increase conversions, so it’s something to consider. If you plan to use video to rank within SEO, I recommend using a platform like Wistia to host your content. YouTube is not a bad strategy, but Wistia has markup specifically for search engine optimization. Ok, so we have done a lot so far. To recap, we have done keyword research, optimized the content, competitor research, and more. Now the question becomes how to add your website to Google and make it more searchable? The answer to getting Google to look at your content immediately is to use Google Search Console. Within Google Search Console, you want to go to the fetch and render the page and tell Google to crawl the content. Make sure you click on request indexing which means that Google will go to this page and crawl the content. Getting your website to the top of Google requires Google to crawl the content, so fetch the page as Google! The majority of this blog post had a focus on Google. Google is the largest search engine by a mile, but ranking in Bing can drive additional traffic too. The correct way to get in front of Bing is to use Bing Webmaster Tools and submit the URL directly to their bot. Bing bot, for the most part, is slow when you compare it to Google bot crawling the web. To drive more Bing traffic to your site, you need to get Bing to check out the content first. Bing makes up about 20% of the U.S desktop market share, so you have an opportunity that most people ignore. 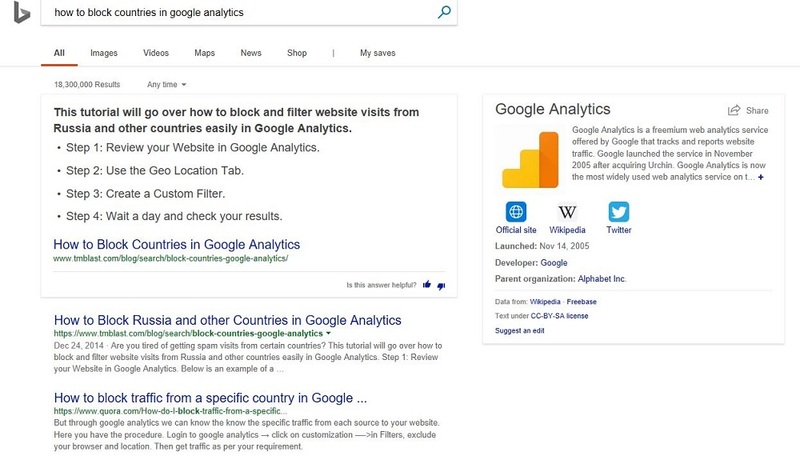 Here are 9 ways to drive more Bing traffic to your site that can help give you additional ideas. Getting your website to the top of Google for free can drive additional traffic and leads for your business for a long time. We know that organic listings continue to make up the majority of click activity on Google, so searchers prefer to click on these results over ads. Everything that I covered in this blog post may sound extensive, but repeating this process for different sections on your site will go by faster each time. When performing correct SEO, you will reap the benefits of consistent traffic and leads that will pay off for a long time.